Created and written by Carson Mell (Silicon Valley), Tarantula — the first primetime animated series pickup since TBS’ rebrand — revolves around the residents of the Tierra Chula Resident Hotel (aka “The Tarantula”). It centers on Echo Johnson, a respected but uncertified tattoo artist who delivers absurd yet introspective monologues. Echo’s poetic ramblings spin tales of misadventures with the other residents, as they partake in party crashing, dumpster diving and other socially dubious acts of mischief. Mr. McBride and Mr. Hill, of course, have East Bound and Down (live action, natch) under their belts, and the new half-hour Vice Principals, which debuted on HBO this month. A few years back they created the cartoon Chozen, so they work both side of the entertainment divide. And bully for them. Add On: Tarantula is now in the scripting stage, with pre-production being done by Rough Draft in Glendale. The show will be staffing up in the months ahead. Wooly mammoths and fuzzy animals still fill theater screens beyond our shores. Three out of the top Box Office Ten are of the cartoon persuasion. And if you count the CG characters in The Legend of Tarzan and Ghostbusters, we're up to 50% of current features being all or partially animated. So I'm not sure how this cartoon parody of Mr. Stewart's will perform, but it's always good to see another high profile TV producer jumping into the animation pool. I'm waiting for the day when 50% or more of all our movie and home-screen entertainment is animated. Two animation veterans, Jay Ahn and Chris Henderson, have launched the full-service animation production company Astro-Nomical Entertainment. The Burbank-based company will focus on producing mid-budget family animated features, parlaying the properties into continued media, including TV shows, video games and mobile content. It will focus on both domestic and international markets, with a special emphasis on China. It looks as though pre-production will be in beautiful Burbank, with production shipped off to Montreal where Free Money is abundant. Mean Margaret will showcase a young human and some furry animals. Furry animals, if you have been hibernating in the North Woods under a rock and hadn't gotten the word, is all the rage. Mr. Ahn and Mr. Henderson both know their way around animated productions. Mr. Ahn's last effort, a CG feature entitled The Nut Job, grossed $120.9 million and cost $42 million to produce. Unless production books were barbequed at 400 degrees, it was a profitable picture. As recent market trends have demonstrated, there is no ceiling on the number of animated features that can frolic in the marketplace. It helps, of course, to have an animated feature that audiences actually want to see, but even if the picture is only "not icky", and costs have been kept to a $30-$50 million budget, the odds are good that profits can be made. At least, that's the current thinking ... which ALSO decrees that there must be some adorable furry, animals inhabiting the movie. Mean Market appears to fulfill that market requirement, so good luck to Astro-Nomical Entertainment! Sony's movie division isn't (apparently) raking in the dough. Happily, Angry Birds, grossing $336 million worldwide, is part of Sony's solution and not the problem. But the company doesn't seem to have a clear idea of the kind of film slate it wants to create. Super heroes? (Spider-Man VI) Topical dramas? (Money Monster) World War II movies? Sony doesn't release a huge number of movies so branding is important. Which brings us to Sony Pictures Animation. Inside the animation division, artists have long complained that executives don't have any vision of where they wan SPAt to go. ("Keeping Amy Pascal happy" was never much of a program). SPony Animation's new topkick Kristine Belson could well goose the division to bigger and better projects, but the executives who preceded her were (as Sony artists tell it) too often floundering. There are a number of pictures in the production pipeline; hopefully they'll perform and make the company proud. Maker, for those who forget, is a network of 1000 internet channels. If this sounds familiar, it's because the Mouse followed DreamWorks Animation in the purchase of the "hot property" known as an internet multi-channel network. Only DWA bought Awesomeness TV for a lot less money than was shelled out by Diz Co. for Maker, and the DreamWorks purchase seems to have panned out a lot better, earning DreamWorks more money. Sometimes it pays to be the first corporation into the New Business pool, rather than the second or third. It's not hard to see why Chairman Roberts went after DreamWorks, they want content and they want merchandise and they want branding for Universal's amusement parks. But at bottom, this all goes back to the big profits that animated product pulls in. The ongoing good times continues to amaze some older artists who remember when times were not so good. While working the IATSE's booth at SIGGRAPH today, I encountered a veteran animator who expressed amazement at how animated features and television show have been booming for the past several years. He asked me how long I thought the salad days would continue. I was happy to answer him promptly, saying I had no idea. Brian Roberts obviously thinks the golden days will continue for a stretch, but I observed that the boom times won't last forever, because they never do. Going back to the 1930s, animation has endured many boom/bust cycles, so it will likely happen again. But what separates this boom from its earlier cousins is the sheer breath of it. Lots of companies are prospering, and that is more than a little different. ... is that Netflix is spending some heavy coin to license Beatles music and make CG animated series for the pre-school set. Because that's the demographic NF is going after here. Netflix is serious about corralling young viewers by any and all means possible. Whether this offering does that job or not, who knows? But nobody can say the SVOD service isn't seriously working at it. ... The kind of rights that Mr. Wakely sought are rarely granted, and the deals were all the more remarkable given his relative inexperience. He had just a handful of credits to his name as a writer and director when he began the process half a decade ago. Securing rights to the Beatles works — including more than 250 songs by John Lennon and Paul McCartney — took three years; the deal is estimated at nearly $10 million. The employment of women in various classification has seen slow but steady growth. Three years ago, women comprised 19% of the work force. A year back, they made up 20.5%. Today their share of Guild animation work is 23%. Fifty years ago, women comprised half of the Guild's employed work force, but the work was concentrated in the back-end of production such as checking, inking and painting. The ratio of men to women in the animation field changed drastically when this work was outsourced to Asia in the 1970s. At the time, there were relatively few women in pre-production categories: writing, storyboarding, design, etc. That older reality is changing. Detective Comics drops a story reel of well-loved super heroes. Warner Bros. Animation has had a hammer lock on the quality presentation of caped enforcers. Unlike Warners live-action group, Bruce Timm and staff never seem to wobble with their approaches to the material. Justice League Dark was rolled out in comic book form in 2011. And the animation group has had more success shaping the material up for wider consumption than live-action producers on the main lot. So kudos to the animation group. This sounds like a studio exec's hot idea ... after a five-day drinking binge ending on the floor of a Rosarita bar in a warm puddle of his own sick. Don't these folks remember what happened when too many penguin movies crowded into the marketplace? Audiences stopped attending them. Too many panda movies will do the same thing. Even the KFP series from DreamWorks has an expiration date. The Animation Guild held an awards banquet for industry veterans. That first Golden Awards Whoop Dee Doo was a pretty boisterous affair. A lot of cartoon veterans hadn't seen each other in years, and Sorrentino's banquet room was packed (the restaurant is now long gone). Bob Clampett was there ... in one of his last industry appearances (he died abruptly four months later in Detroit Michigan), as was Chuck Jones, Eric Larson, Cal Howard, Bill Hanna and Grim Natwick among numerous others. Because there were so many honorees, award presentations were brief, but food and drink were abundant and there was lots of lively talk at the long tables. The only comparable gathering of animation talent occurred six-plus years later at Grim Natwick's 100th birthday party at the Sportsmen's Lodge. Chuck Jones receives his Golden Award from Business Representative Bud Hester. 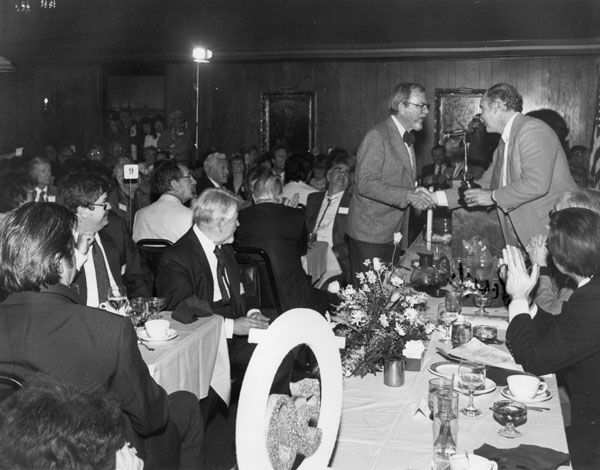 The white-haired man in the middle distance (behind and to the right of table-marker "9") is the veteran Disney director Jack Kinney. Disney animator Eric Larson sits with his back to camera in the center of the picture, while Disney's Joe Hale -- then the producer of the oncoming "Black Cauldron" -- sits across from Eric in a Western string tie, looking up at Mr. Jones. Animatics (digital story reels) got invented in the late 1990s. I thought. There had been story reels on film -- combining story sketches, voice tracks, effects tracks, and temp music -- for decades, used for animated features back to when Walt was thin and had shiny dark hair. But story reels for TV? Until computers and low-cost digital storage made the suckers inexpensive and easy, they were avoided like the Zika virus. Now of course, animatics/story reels are ubiquitous in TV land, and every cartoon producer -- with the notable exception of Genndy Tartakovsky -- makes sure he's got them. I have memories of watching Crusader back during the paleolithic age of television, but those memories are wrong. Because I remember the show as being animated. What I'm remembering is the show's opening, that four-and-a-half seconds where the rabbit thunders into view on a horse. That is honest-to-God animated action, and about the only chunk of the presentation that is. The rest of the show? Nothing but a story reel. Held drawings, the occasional semblance of a moving mouth, and the ever-popular pulled cel. As for the rest, it's all edgy narration and snippets of repartee between rabbit and tiger. Crusader Rabbit got sold station-by-station across the country, sliced into various bite-sized chunks of four-minute segments, eight-minute segments, or half-hours. The show had a strong impact on little kids (I know because I was one of them) and provided a template for Bill Hanna and Joe Barbera seven years later when M-G-M closed their cartoon division and Bill and Joe marched into the new medium to create their own brand of cartoons for TV. But before H & B or any other television cartoon studio, Crusader Rabbit invented TV cartoons. And ... because Anderson, Ward, et al were hard up for money, the TV animatic. The latest, which was still-born across the fruited plain, has lots of running room left on the international playing field, where it's collected $200 million. This franchise has made trainloads of money for Fox, but every franchise gets old and under-powered. Meantime, The Secret Life of Pets made another $10 million overseas, with a total accumulation of $324 million. Finding Dory is looking to breast stroke across the $800 million marker before another week sails by. ... announces new animated product. ... During their Comic-Con panel on Saturday, July 23, Marvel Animation announced a new full-length animated film, Hulk: Where Monsters Dwell. The movie will focus on the Hulk and Doctor Strange, and will also feature the monster team known as the Howling Commandos. The movie is described as being dark, creepy, and more adult than any of the shows Marvel is currently producing, which could mean it was somewhat influenced by the more adult-oriented animated films coming out of DC. The film will be released sometime this fall. Never, but never, underestimate the power of Free Money. Three animated features in the Top Ten, but the new one with big furry elephants and a twitchy ground squirrel doing less well than the furry elephant movies that came before it. Ice Age 5 will be making most of its money overseas. The good news for Fox is, the picture is already raking in tall piles of loot beyond American shores. Brad Bird introduces The Giant's Dream: The Making of the Iron Giant. ... The documentary spends a good deal of time examining how “The Iron Giant” succeeded in making a moving, human story about a robot and a small boy contemplating the meaning of life. Citing “the best test scores” Warner Bros. had seen since the mid-’80s and widespread support from critics, “The Giant’s Dream” successfully balances the good and bad of the film; and deftly explains how a film quickly seen as a flop could develop into a relevant tale for modern audiences, especially in light of recent gun-related tragedies. I remember when Warner Bros. Feature Animation started making Iron Giant. The division was in trouble. It had released Space Jam (a hit) and Quest For Camelot (decidedly not a hit) and there had been management changes. The company did not give Iron Giant a large budget, but a dedicated crew turned out a superior movie. If The Iron Giant had been made as a CG feature in 1999, with the same designers, actors, and story beats, how would have it performed? More than likely very well. South Park isn't covered by a Guild contract (or many other CBAs, from what I've been told) but twenty years a a milestone. And Younger Son has watched it for most of its run. I don't blame him, even though he's a traitor to his union mother and father. The show is often hysterically funny. Since Monday I've attended the International Alliance of Theatrical Stage Employees' Executive Board Meeting, high above the San Francisco Bay. There have been reports from all around the country. Production reports. Organizing reports. How the IA is using social media and all the other new technologies to communicate with its members. The contracts negotiated last year now have finalized new language after twelve months of review and fine-tuning. The IA now has 9 new signator companies, and there are multiple new reality (non-scripted) shows under contract. Mobile device viewing is up 25% year over year; regular TV viewing is down 10%. Vancouver is now the largest visual effects production center on the continent. Rough Draft Studios has now signed a contract with The Animation Guild, after holding a partial production contract in 2006. The IA and TAG worked together to make the contract happen. Tax subsidies are pulling live-action productions to various states. Ohio, Kentucky, New Mexico, and Georgia have incentives (also California and Georgia) have incentives. States that have ened subsidies have lost production work almost immediately. One hundred percent of U.S.-based live-action production work shot in Canada is under IATSE contracts. Organizing is robust in the Southern U.S., and more grievances are being filed on the West Coast with the help and support of IA representatives. Organizing movies and television shows has been a key activity of the West Coast office since major contract negotiations ended. The Plan now holds $8 billion in assets, and 46,000 participants. The were 89 million hours of contributions flowing into the Plan in 2015; hours are running 7% above that number in 2016. And health coverage expenses are running 3% below projections in 2016. $1.4 billion in total assets. 69,000 participants are under the National Plans' annuity funds. From another report: technology is driving the consolation of TV jobs, cable jobs, news jobs, and the public airwaves. Broadband is being sold to te highest broadband for profit maximization, and the news media isn't covering the story very much. Today's the big opening. But the opening is only a wee part of it. ... [Comic-Con launches today, but] promo-wise the San Diego confab is already in full swing with The Walking Dead, Conan O’Brien, Marvel’s Doctor Strange and Designated Survivor dominating. Once upon a long ago, Comic-Con was a couple of rooms inside the El Cortez hotel with comic book enthusiasts buying and selling the old time magazines off of card tables. And there were a few other geeks wandering around in movie costumes. But then the entertainment conglomerates discovered the convention was a spiffy way to promote summer blockbusters, animation, and various t.v. shows, and the hawkers of comic books got shouldered aside. And now it's all about the newest Marvel product on large or small screen, and panels with actors and directors, plus a generous dollop of animation since that is the other hot category of movie these days. Oh yeah. And late night talk shows broadcast from San Diego, because the interlocking of promotion platforms needs to be total and complete. Comic-Con has long-since stopped being a comic book convention. Now it's a venue for large companies to tub-thump for their big-budget summer tent poles, be they live-action or animated. The Powerpuff Girls has been renewed for a second season. The studio has announced pick ups before, then it turned out they were just divvying up shows already in the pipeline into multiple seasons. Not saying this is happening here, but beware of press releases. "New shows" sometimes mean shows already in work are getting labeled "Season #2", "Season #3," etc. Mr. Katzenberg journeys on with his life (DreamWorks employees tell me he's been very relaxed in and around the DWA campus). Chris Meledandri works to figure out what he wants to do as regards Universal-Comcast's newest subsidiary. An associate says the question [Chris] Meledandri is pondering is: "Should he take time away from his own things [work on DreamWorks Animation projects] or focus on what he's doing [Illumination Entertainment]? He's certainly not going to let his own people be deprived of enough of his attention and suffer." In 2016, there already are more demands on him than usual because, for the first time, Illumination is releasing two movies in one year: Pets and Sing (Dec. 21), with voice talent including Scarlett Johansson and Matthew McConaughey. Management announced Shrek 5 and Shadows to a gathering of employees some days ago. Shrek 5 makes sense, in the same way that Star Wars: The Force Awakens makes sense. Shrek has been a big franchise and Universal is going to work to kick it into high gear again. Maximize the cash flows of the new acquisition, that's going to be the corporate mantra. As for Chris Meledandri, execs who know him say that he likes to immerse himself deep in the nuts and bolts of a project. He likes to have long involved meetings with the olks developing and making the movies. He takes time to reflect on the options before him. Based on those things, large seismic changes at DreamWorks Animation's Glendale campuses aren't likely to happen in a lickety-split manner. Projects keep springing up like mushrooms. “Household Pests,” based on an original idea from Pablos, follows an imaginative boy, “Cole,” who battles monsters under his bed every night, while his mother refuses to believe that they exist. It takes “Jeb Dee,” an undercover monster exterminator, to help Cole save the town. Concurrently, the fund will also invest in a second animated project – “Mean Margaret” - based on the popular children’s book of the same name. That film is being produced by Jay Ahn (“The Nut Job” and “The Nut Job 2”) and Chris Henderson (“Return to Neverland,”) with Chuck Williams (“Brother Bear”) managing the creative for Astro-Nomical Entertainment LLC, a new studio from Ahn/Henderson. The continuing ... and escalating ... success of animated features keeps pulling new players into the market. For a half dozen years there have been warnings that too many cartoons on theater screens will tank the market, but that old chestnut isn't dissuading new players. They've figured out that the calculation of "too many cartoons" has ALWAYS been seriously flawed. It's starting to dawn on people (because boffo box office can be persuasive) that animation is a mode of presentation, not a "genre" of filmmaking, like musicals of super hero epics. As I've said a few times, nobody ever pontificates: "Well, the reason that Jennifer Aniston's new comedy arrived still-born is because there's just too damn many live-action movies out there." Nope. Ixnay. They let us know that Jen's latest wasn't funny and stunk up the local AMC. And therefore hardly anybody loaded the wife and kiddies into the minivan to go down and see it. This isn't complicated. When people want to see this or that motion picture, they go see it. People go to animated features in droves because they like the stories, the worlds and characters they're presenting. If that hasn't become obvious by now, maybe it never will. Extending brands across new distribution platforms, that's what it's about. Technology is reshaping the entertainment landscape. The most profitable corner of movie-making? Animated CG features, something that didn't exist prior to 1995. Our fine, entertainment conglomerates recognize that brands need to live on many platforms in order to make money on cell phones and flat screen televisions and global movie screens and (let's not forget) sell toys, games, and every manner of books (do people still READ those things. So virtual reality? A new partnership? If it extends brands and profits, why the hell not? Day after tomorrow, this feature gets a screening in San Diego. I've got a feeling (call it a hunch) that it won't be doing The Secret Life of Pets business. July 1, 1941- THE FIRST TV COMMERICAL - During the live coverage of a Brooklyn Dodgers-Philadelphia Phillies baseball game the first FCC sanctioned television commercial aired. It was for the Bulova Watch Company. July 1, 1970- Hanna Barbera’s attempt to revive the adult primetime animated series with “Where’s Huddles?” It lasted one season. July 2, 1982- Don Bluth’s The Secret of Nimh premiered. July 2, 1986- Walt Disney’s The Great Mouse Detective released in theaters. July 4, 1905- Los Angeles developer Abbott Kinney had broke with his partners over the plans for the Santa Monica Pleasure Pier. He moved down the coast to some marshy wetlands and built a new community with canals, lagoons and gondolas. VENICE California opened on July 4th. In 1925 the City of LA got rid of most of the canals and gondolas. Venice went on to be a seaside mecca for beatniks, hippies, weightlifters like young Arnold Schwarzenegger and VFX houses. July 4, 1956- MIT’s TX-1 Whirlwind computer added an adapted typewriter keyboard to enter data. The first computer keyboard. July 5, 1934- The San Francisco General Strike- 100,000 San Franciscans refuse to go to work in a spontaneous demonstration to protest Governor Frank Merriam’s use of the National Guard to shoot striking longshoremen on the Embarcadero. The third largest city in the U.S. was completely paralyzed. Gov Merriam declared martial law but the tanks in the street were helpless. On the 5th day San Franciscans all went back to work. July 6, 1957- Chuck Jones short “What’s Opera, Doc?” debuted. July 8, 1982- Disney’s TRON premiered. July 9, 1993- Industrial Light & Magic completed its transition to digital technology by shutting down its Anderson Optical Printer. The Optical Printer system of mattes had been the way VFX had been done since 1909, but the Digital Revolution had changed everything. July 13, 1925- Walt Disney and Lillian Bounds marry. Lillian was one of the first female animation ink & paint artists. July 17, 1955- Disneyland opened. July 17, 1968- George Dunning’s The Yellow Submarine. featuring the Beatles premiered in London. July 17, 1999- Studio Ghibli’s My Neighbors The Yamadas premiered. July 18, 1939- MGM tried a sneak preview of the film The Wizard of Oz. Afterward they debated cutting the song "Somewhere Over the Rainbow" as slowing down the pace. Finally they decided to leave it in. The film debuted in August to wild success and acclaim. July 20, 1973- Bruce Lee died of a cerebral edema one month before his last film Enter the Dragon premiered. The handsome martial arts star single-handedly made Kung Fu a national craze and the Kung-Fu film a regular in world movie theaters. July 22, 1989- Nintendo released the Gameboy. July 23, 2004- Two armed men enter the Munch Museum in Norway and stole Edvard Munch’s masterpiece The Scream. It was recovered with some water damage in 2007. July 25, 1943- The Birth of L.A. Smog! A newspaper headline from this date mentioned a ‘gas attack’ of exhaust and haze that reduced visibility to three short blocks. July 25, 1984- The Lucasfilm Graphics Group (later Pixar) released their first short The Adventures of Andre and Wally B.
July 25, 1951- CBS conducts the first broadcast of color television. NBC made color TV popular in the mid 1960’s. July 26, 1951- Charlie Chaplin driven into exile by anti communist red-baiters. Whether you think change is a net positive or negative, change happens. And change will be coming to the Animation Guild this Fall and Winter. ￼I will be retiring as Guild business representative as of December 6th. I will also be leaving the Animation Guild’s executive board after 33 years. (I served as Guild Vice-President from 1983 to 1986, then served as a board member until 1989 when I became Business Representative). Jack Thomas, our Guild President, will also be stepping down and leaving the board. And a number of long-serving officers and board members will be departing as well, which means the Animation Guild will have more empty chairs to fill than at any time in recent memory. So here’s my pitch to any active, qualified member reading this: If you want the animation industry to get better and stronger, if you want the artists, writers and technicians working in it to be more fairly compensated for their work and treated in more enlightened ways, if you believe the industry can be made better from top to bottom, then come to the General Membership Meeting on Tuesday September 27th , and throw your hat in the ring. Run for an Animation Guild office. Experience has its place, but it’s not a prerequisite. When I came to the Guild’s General Membership meeting back when Reagan was President, I had no idea anybody was going to nominate me for Vice President or anything else. I had been through a long Guild strike, but I had been to three union meetings in my life. I barely knew where the union hall was. I was pretty much a blank slate (putting it kindly) as regards union politics. But I got myself elected, started serving as the new Veep, and learned. And I found out, as President Emeritus Tom Sito once said: “It’s the most challenging job you’ll ever love.” I served on Guild trial boards, I weighed in on workplace conditions, and I got a glimpse, via the executive board, of how studios not named Walt Disney Productions actually operated. (Until I was on the board, I worked in a pretty cloistered environment inside the Mouse House and didn’t really understand a lot of workplace issues). Today, your Guild’s executive board formulates Guild policy, helps negotiate contracts, weighs in on grievances against studios, and (in short) has a bird’s eye view of what’s happening in a part of the entertainment industry that has never been larger, more profitable, or more influential than right now. So what do the jobs of Guild officers and board members entail? If you’re Business Representative, you’re a full-time, paid employee of the Guild. You run the Guild office and supervise Guild staff. You pretty much steer the Animation Guild (with the Guild President as your co-captain) and work with the board to make policy. You file grievances on behalf of members and chair negotiations with the studios. You serve as a member of the Executive Board. If you are the President, you collaborate with the Business Representative on Guild matters. You preside at membership and executive board meetings, you’re an ex officio member of all TAG committees. Executive Board Members have general supervision of the affairs of the guild. They decide on matters referred to them by the Business Representative or the membership, and investigate complaints brought to them by the membership or the Business Representative. The Animation Guild has never been larger, more robust, or more prosperous than it is right now. Members in their fifties and sixties have been running TAG for years; now is the time for younger members to step up and mold the Animation Guild into the organization they want it to be. Three of of the top five features in the global marketplace are animated features. Five out of the top five features have large amounts of animation from front to back. A lot of the cinematic product made today contains an abundance of CG animation. Given current box office results, there will be more animated and hybrid features put into production in coming months/years. Our fine entertainment conglomerates know when they're on to a good thing. And act on the knowledge. DreamWorks Animation’s “Kung Fu Panda 3,” distributed by 20th Century Fox, earned a second week atop the NPD VideoScan First Alert sales chart, which tracks combined DVD and Blu-ray Disc unit sales, and the dedicated Blu-ray Disc sales chart. Holding onto the No. 2 spot on both charts for a second week was Walt Disney Studios’ “Zootopia,” which in its fifth week sold 78% as many copies as the “Panda” sequel in its second (and 71% as many Blu-ray copies). While animation doesn't generate the multi-million sales of little silver disks tht happened before streaming and Subscription Videon on Demand, it still performs better than many live-action titles. This happens because Blu-ray and DVD players are incredibly inexpensive, and children love to watch their favorite cartoons ... over ... and over ... and over. Older technologies fade over time, but they seldom go completely away. (Has radio disappeared? Movie theaters?) Our fine, entertainment conglomerates will sell their Intellectul Property across any and all distribution platforms. Blue-ra and DVD disks, and before them rectangular VHS tapes, generated millions in revenue. Certain cash stream have declined, but studios have no intention of abandoning them. So if animation makes money on small shiny disks, Disney, Comcast-Universal and the rest will keep selling them. Both current and classic animation generate cash, and titles keep selling, even as Hangover 2 and Date Night have become minimalist titles on Amazon. Live action comedies have limited life-spans. Snow White, Pinocchio and Toy Story. are forever. Animated features and live-action movies with abundances of animated effects crowd against the top of the list. For the next several years, there will be a surge of cartoons with funny, wacky (and whacked out) talking animals. The planning sessions are happening even now. At the link, Deadline loused up the total cume for "Finding Dory". Someone over there will likely notice the erro and correct it later in the morning. In the meantime it's corrected here. As of Thursday, Secret Life of Pets had earned $152.6 million and second place Finding Dory and tucked away $434.5 million. This can't possibly be correct. How can two animated features be thriving at the same time? HOW? And if you tell me "They're different", I will tell you "cannibalization!" ... "Crowding each other out of the marketplace!" Because two animated features can't co-exist in the Big List without one or the other (or BOTH!) being mortally wounded! Not possible! Randy Lake, president of Sony Pictures Imageworks, the Academy Award®-winning visual effects and animation unit of Sony Pictures Entertainment, today announced four new hires at the studio’s Vancouver headquarters: senior VP, production, Michelle Grady, VP, artist management, Ryan Pollreisz, veteran visual effects supervisor Sue Rowe, and art director Daniel Cox. Michelle Grady, senior VP, production, will oversee Imageworks’ growing roster of more than 600 visual effects and animation artists. Grady has spent 23 years in the Visual Effects and Post-production industry in Vancouver, where her career grew alongside the expanding film production business in the city. She joins Imageworks from visual effects studio MPC, where she served as head of film, managing projects including Batman v Superman, Guardians of the Galaxy, Godzilla, Maleficent, and Life of Pi. Prior to MPC, Grady was VP and general manager at Technicolor. She will be taking over for Lydia Bottegoni, who currently heads production for Imageworks, and will be stepping down later this summer. As VP, artist management, Ryan Pollreisz will manage crewing, recruiting and training for Imageworks. Pollreisz joins the company from his previous position as managing director of production at Deluxe and Encore. Sue Rowe, visual effects supervisor, joins Imageworks from MPC in Vancouver. Talented in traditional animation, 3D animation and compositing, she has nearly 20 years of experience in the industry on projects including The Maze Runner, John Carter, X-Men: The Last Stand, Troy, and visual effects Oscar®-winner, The Golden Compass. Daniel Cox joins Imageworks as visual effects art director, with substantial experience as an illustrator, storyboard artist, and art director on projects including Pirates of the Caribbean: Dead Men Tell No Tales, The Great Gatsby, The Wolverine, and Gods of Egypt for studios including Animal Logic and Weta. Sony Imageworks continues to thunder along ... in Vancouver. That's the way big corporations roll these days. If there's cash being handed out, they are THERE. Free enterprise, fck yeah! All self-respecting blogs are supposed to announce these, yes? It's a rule. There are a lot of talented artists and directors in the Television Academy who spend a lot of time reviewing animated shows submitted to the TV Academy. The amount of animation has grown over the years, so it's a challenging job. (It's amazing they can enough carve time out of busy careers, but somehow they manage). Our congratulations to all the nominees. As many know, the Animation Guild covers just about every kind of artistic and technical job related to animation: writers, board artists, animators, designers, background artists, and technical directors. (The Guild doesn't cover production people). out of the employment doldrums of the early oughts. Even with the record-high employment, there are abuses that continue: non-comped overtime; overlong storyboard and design tests; unrealistic schedules. Many of these issues have existed for decades, and they are much like plastic pop-up moles in arcade games. A problem gets taken care of on one studio production, and (whattayaknow!) up pops its bristly little head on another show. These meetings are open to active and inactive Animation Guild members. As we get nearer to meeting dates, handy reminders will go out via e-mail. Knowledge is power, and the more knowledge you have, the more effective you'll be steering your career through the corporate shoals. Well, they make boatloads of money, that's one simple, obvious reason. But WHY do they make money? As previously stated, the movie industry has been doing this kind of thing. Pushing emotional buttons, servicing audiences' pleasure and nostalgia centers, that what Hollywood has been about. From the dawn of movies as mass entertainment, they've built films around genres and movie stars. At the height of the star system, movie companies tailored features to their lead actors' most winning (and bankable) personality traits. Like for instance, here's Clark Gable in the quintessential Clark Gable role, maximizing MGM's profits. In the world of cartoons, Disney famously declined to make sequels to his features, but there were plenty of sequels with shorts centering on Disney stars: endless Mickeys, a whole flock of Mickey-Donald-Goofy extravaganzas, even a sequel to The Three Little Pigs. Now that the power of movie stars and "star vehicles" has faded, studios have decided that sequels of earlier blockbusters are the surest way to riches. And the best, most sure-fire route is replicating an original hit's structure and DNA. That's why, for instance, the new Star Wars feature carefully mimics the story beats of the 1977 film. Why the on-coming live action version of Beauty and the Beast apes the animated feature. Why Toy Story II and Toy Story III are scrupulous about fulfilling audience expectations by keeping the characters true to their original selves. Nostalgia and pleasure centers are powerful things. Our fine, entertainment conglomerates have figured this out, and profited from the knowledge. As goes Universal/Comcast and DreamWorks Animation, so goes a toy company and foreign cartoon studio. Hasbro has been a presence in animation for multiple years now. They run the playbook started by Filmation thirty-plus years ago with He-Man, that Disney does with the Cars franchise. And that ... to be frank ... every entertainment conglomerate does with its animated movies and television shows: use the animated product to sell loads of games, action figures, plush toys, etc. But what this means (probably) is that Hasbro sees itself being in the animation game for the long haul. And will be creating animated half-hours until the plastic merchandise beloved by children disintegrates and blows away. That will likely happen sometime around 2132. "We've got three weeks of animation left, then there's a fairly long gap before the next feature. I don't know how that's going to impact people's schedules." I've seen this kind of production fatigue before. It happens toward the end of many demanding pictures. People get burned out, staring at flat-screens all day long, watching the same scene or sequence over and over. The Disney crew is working sixty-hour weeks; some people choose to do five twelve-hour days and others opt for six ten-hour days. Either way, it's demanding, especially after going on for months. The original Space Jam back in the '90s had a much crazier schedule. The crew had less than ten months to do a pile of hand-drawn animation. People were sleeping under their desks and working 12-hour, seven-day weeks. To walk through that production was memorable. Artists were imbecilic with chronic fatigue. Artists were dozing over their light boards. Moana's schedule isn't close to being as radical as Space Jam's was. Still in all, the crew is feeling the weight of a long, complex production. Another feature animation director crosses over to live-action. Jennifer Yuh Nelson, best known for helming the Kung Fu Panda movies, will make her live-action directorial debut with Darkest Minds, Fox’s adaptation of the YA trilogy by Alexandra Bracken. Jennifer Yuh Nelson broke into animation two decades ago, working as a board artist in television. Being multi-faceted, she also worked as a designer, a background artist, and writer. 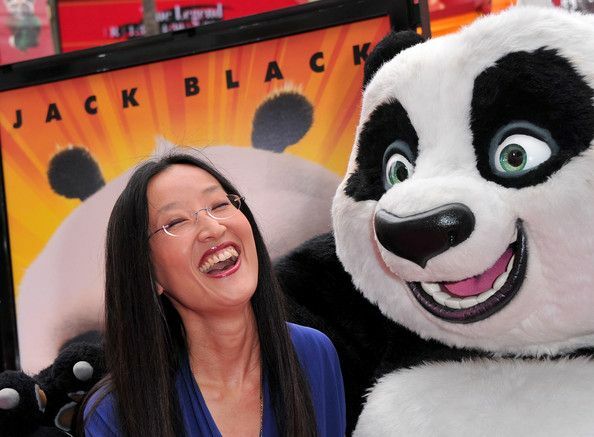 She came to DreamWorks Animation a few years after its founding, and worked as a story artist on various DWA features before directing the hand-drawn segment of Kung Fu Panda, then directing the whole kaboodle on subsequent Pandas. Given the trajectory of Jennifer Yuh Nelson's career to date, the move to live-action seems as though it's part of a natural progression. Jennifer talks about her artistic career at this link and this link. ... The highest grossing box office year for animation was 2013, which saw over $1.6 billion in ticket sales thanks to having three films in the top 10: Frozen, Despicable Me 2, and Monsters University. This year, there are four films currently in the top 10, and animation has already grossed over $1.1 billion, with half a year left to make up the difference. It won't take much for the remaining features combined to be successful. Kubo and the Two Strings will see one more major animation release this summer and even if it doesn't set the box office on fire, it should set everything up for a massive holiday season. We used to be told (over and over) that animated features gobbled each other up at the box office. That there was a glass ceiling for long-form animation and our fine, entertainment conglomerates were making too many cartoons, damnit! But the premise was always flawed, because animation is just one more format for telling stories on a big screen. If you're telling a variety of tales that audiences want to see, then there really is no cannibalization. There are now two animated features in the marketplace that people want to see, one about fuzzy domesticated animals and one about fish in the sea. For some reason, upright carbon-based life forms have no trouble paying tickets to view both, probably because different characters and plotlines inhabit each of them. This is not a hard concept to grasp if you frontal lobes aren't too small and under-used. I believe the media is now catching on to this dynamic. Because the talk about one cartoon dining on another cartoon has pretty much stopped. Finally. As Mr. Deneroff puts up the last of these archived interviews (and many thanks to Mr. Deneroff for posting them), here is background artist Johnnie Vita and animator Ed Aardal, remembering when. ... When Ralph Bakshi got Fritz the Cat as a feature, he brought Johnnie Vita along as his Background designer and artist. This was arguably the best decision Bakshi made on the film. Longtime animator Edwin Aardal came into animation in 1935 (the same year Johnnie Vita entered it on the opposite side of the continent). He worked at Disney as both an effects animator and character animator, on both shorts and features. Ed Aardal passed away in 1988, aged 77. You might be asking: Why do these interviews appear on both Cartoon Research and The Animation Guild blog? The answer's simple. Mr. Deneroff has done most of the work on these 1980s questions-and-answers, and posts them like clockwork every Monday. The Guild, since the interviews were stored at our headquarters all these years, puts them up as well. It's now all the rage! ... Counting this year’s successes — Paramount’s “10 Cloverfield Lane,” Universal’s Melissa McCarthy comedy “The Boss” and Warner Bros.’ “Central Intelligence,” which all made it into the top 20 of 2016 so far — fresh intellectual property is decidedly hoisting up this year’s box office. These things go in cycles. When remakes are big (Cinderella, Jungle Book) they make the same pictures over again. When sequels are the order of the day, well whattayaknow! Let's make sequels! (All with the same magic story beats as the originals). But none of this is new. Hollywood made the equivalent of sequels and remakes in the twenties, thirties and beyond. Doug Fairbanks or Clark Gable of Tyrone Power films. Stars had features tailored to their screen personalities, most with similar story arcs. So sure, they were not (technically speaking) remakes or sequels of earlier successes, but they were pretty close to the type of movie products we see and love today. When filmmakers find themselves a winning template, they tend to replicate it. And as more than one critic has noted The Private Lives of Pets borrows lots of its narrative building blocks from Toy Story. In the end, there is little that is fresh and new under the sun. And the flak Disney takes for them. Seemingly everyone has an opinion — often delivered as a demand — about what Disney should be doing with its characters, especially when it comes to diversity. Okay, the male character in Moana might be comfortably built, but doesn't the fact he's voiced by Dwayne "The Rock" Johnson (not comfortably built) count for anything? Obviously an entertainment conglomerate that desires the continuing goodwill of the public has to keep tabs on various bubbling cauldrons of discontent and address centers of anger. But placating one group sometimes alienates another. How about having characters serve the contours of your story and using analogies ... in the way the fox, rabbit and other animals work as surrogates for humankind in Zootopia ... instead of being heavy-handed and hitting this issue or that directly on the head? A plethora of animation decorates the global box office. July 9, 1981 - Walt Disney's the "The Fox & The Hound," released. The first animated feature Walt Disney had no input on. Although the film has brief screen credits, it marks the torch being passed from the Nine Old Men golden age generation to the modern generation of animators. A complete personnel roster would include Frank Thomas, Ollie Johnston, Woolie Reitherman, Tim Burton, John Lasseter, Bill Kroyer, Don Bluth, Lorna Cook, Henry Selick, Brad, Bird, Steve Hulett, John Musker, Jerry Rees, Glen Keane and many more. The picture made quite a bit of money for the studio, and a direct-to-video sequel was produced, but I always thought the original could have been stronger. Sure, it has a wham-bam climax animated and boarded by Glen Keane (directed by Rick Rich), but Ron Clements, me and several others argued that the old dog Chief should have been killed to strengthen the story and hunting dog Copper's motivation. No luck. In the late seventies, killing off a protagonist in Disney animated feature was strictly forbidden. So Chief remained injured but alive, the plot of the picture suffered, but the studio still got itself a profitable picture. So for the first time in a long while (maybe forever? ), animated features are #1 and #2 on the Big Movie Grosses List. And in the "Show" position (#3) is a live-action movie with a whole lot of animation wrapped inside it. (UPDATE: Okay, so Dory is now #3. But it's still accumulated a tidy pile of greenbacks). There remain three other animated features hanging by a thread in release at a minuscule number of theaters. The Angry Birds Movie has $106 million; Zootopia owns $341 million; Kung Fu Panda finishes up at $143.5 million. The sequels are definitely coming to a finish, says the Prez of Pixar. Right after the next Incredibles sequel, next Toy Story sequel, next Cars sequel ... and so forth and so on. See, it's like the substance abuser who says he's swearing off the cocaine ... or weed ... or crystal meth. The promise to stop is very heartfelt at the time of announcement, but back sliding is so easy. And in the case of animated sequels, so fcking profitable. Let's be honest. Filmmakers can always get inspired to come up with "a new story that needs to be told, and that we're all very excited about!" when there's marketing and distribution divisions breathing down filmmakers' necks. It truly inspires that good old inspiration. And if division chiefs feel better pretending cartoon studios owned by conglomerates are actually Renaissance art studios, who does it really hurt? Only a handful of animation geeks who believed the pronouncements in the first place. There is now preliminary sign-off on the wage collusion case. A federal judge gave preliminary approval to a settlement between animation workers and two major animation studios on Wednesday night. Blue Sky Studios and Sony Pictures agreed to pay animation workers and visual effects producers a total of approximately $18 million under the settlement. "The court finds that the agreed-upon consideration of $5.95 million for Blue Sky and $13 million for Sony Pictures is fair and reasonable based on the circumstances, risks involved, and significant recovery from two of the companies whose share of employee-years comprise 20.3% of the class," U.S. District Judge Lucy Koh wrote in the order. Other major studios named in the class action, including Pixar, Dreamworks, Lucasfilm, Disney and ImageMovers Digital, continue to fight the case. Lead plaintiffs Robert Nitsch, Georgia Cano and David Wentworth stand to receive $10,000 as a part of the settlement. Of the approximately 10,000 class members in line for a payday, 2,038 have worked at Sony and 578 have worked at Blue Sky, according to their attorney Brent Johnson. The recovery for each of the class members averages $1,026. It's difficult to know with certainty where this lawsuit will end up. Some of our other fine, entertainment conglomerates continue to fight it, and they are hanging some of their hats on the issue of timeliness. Their argument is that plaintiffs knew of the shenanigans and waited too long to file claims against them. After moving the animated movie [The Lego Movie Sequel] to Feb. 8, 2019, Warner Bros. has also hired Raphael Bob-Waksberg to rewrite the script. Phil Lord and Christopher Miller, who directed the first film, penned the original draft. With the duo currently prepping for the “Star Wars” Han Solo spinoff, the studio opted to get a fresh take on the script. Rob Schrab is directing with Lord and Miller producing along with returning producers Dan Lin and Roy Lee. The Lego Movie Sequel is the fourth film in the Warner Bros. franchise, which has two other spinoffs on the horizon: The Lego Batman Movie is set for Feb. 10, 2017, and The Lego Ninjago Movie is scheduled for Sept. 22, 2017. This "rewrite" thing should surprise nobody. Animated features always get reworked, restructured, rebuilt from the ground up (etc.). Happened on the old Disney features; happens today. Sometimes the second or third pass pays off in spades, yet a happy ending is not always the end result. How To Train Your Dragon got redone and was a solid gold hit for DreamWorks. On the other side of the coin, Pixar's The Good Dinosaur received a do-over and laid a damp fart. Hal Ambro and Lee Blair were a bit higher profile than Morey Zukor and Al Bertino, profiled here on Monday. They're reasonably famous names to animation enthusiasts, but not to a lot of other people. Back in the seventies, old timers at Disney Feature told me what a crackerjack artist and animator Hal Ambro was. But Hal, though he started in animation in the first half of the 1930s, arrived at Disney in 1939 (some sources say '46), after all the supervisory slots had been filled, and none of the top guys -- later known as "the Nine Old Men" -- were pre-disposed to vacate them in favor of a newcomer. (Funny how that works). Mr. Ambro was an animation work-horse at Disney for twenty years, after which he animated for Chuck Jones and put in a stretch of time at Hanna-Barbera, working on three different features (Heidi's Song, Charlotte's Web, Rock Odyssey). He taught the arto of animation at the California Institute of the Arts starting in 1983, and passed away in 1990. Lee Blair, brother of Preston and husband of Mary, led multiple artistic lives. He was an animator (and proud of it), he was a color designer, and he was a creator of fine art, principally watercolor landscapes. Mr. Blair does a pretty thorough job directly above, thumb-nailing his life and career in animation. He served in the Navy the Second World War making training films, then after de-mobilization opened Film-TV Graphics in New York, which produced commercials and industrial films. He wrapped up his long career teaching and painting fine art in Northern California. Lee Blair died in 1993. * In point of fact, these interviews appeared on Cartoon Research before the interviews we put up a few days ago, but yours truly is just getting around to installing them here, for which apologies.